Mounted on your roof, the collector captures the heat from the sun and transfers it to the liquid circulating through the panel. The heater tank is your house current boiler/ hot water heater. The heated water captured by the collector panel is stored in the tank for later use. The heat exchanger transfers energy captured by the collector panel into water stored in the heater tank. In our system the heat exchanger is external to the solar storage tank. Ensures that the system’s pressure does not exceed pressure limits set by the system designer. The control system consists of a controller and a circulating pump. The controller compares the exit point temperature difference between the heat exchanger and the collector. When the collector panel temperature is higher than the temperature of the heat exchanger, the controller turns on the pump and circulates the liquid through the system until the temperature is equalized, at which point it turns the pump off. Passive solar systems are desirable in areas where freeze protection is not an issue. A passive system integrates a 40-80 gallon tank with a collector panel. In a passive system, water flows directly into the rooftop collector. As water is heated by the sun it rises into the storage tank, and displaces the cold water, which is pushed into the collector. The cold water is then heated by the sun, rising into the storage tank and the process repeats itself. This creates a continuous flow of heated water into the storage tank during the day time. When a hot water tap is opened, hot water flows from the storage tank into your home/business. We offer several passive solar hot water systems. To determine the best system for your needs, Contact Us. An active solar hot water system uses station pumps, a controller and a heat exchanging unit, or a drain back tank. There are two types of active systems: open and closed loop. In a warm climate an active open loop system is desirable and practical. The water flows directly through the collector into an insulated water storage tank. We offer a selection of Open Loop Active solar systems. For the Open Loop Active system that best suits your needs please Contact Us. In colder climates, the most common system is a Closed Loop system using an antifreeze heat transfer fluid. In an Active Closed Loop system, a safe antifreeze heat transfer fluid is pumped through the collectors and transfers the absorbed energy thorough a heat exchanger to the water which is stored in an insulated water storage tank. 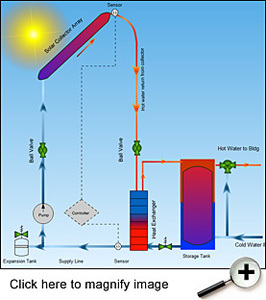 See an animated illustration of a solar hot water system. Learn more about the main components of a solar hot water system. See the anatomy of Solar Flat Plate Collectors. See the anatomy of Evacuated Tube Solar Collectors. Learn about solar thermal collector efficiency. Learn about SRCC Ratings (OG-100 and OG-3oo) and what they mean. Learn about sizing your Solar Water Heater storage tank. Learn about sizing of your solar water heater expansion tank. Contact Free Hot Water to design a solar thermal systems that’s appropriate for your home or business for numerous applications, from homes and solar pool heating, to designs for multi-unit dwellings, hotels, nursing homes, and more.